Yesterday, the author of the very large and innovative manuscript dropped in to pick it up and discuss it. We had a good natter about its possibilities, and the Asia-Pacific Triennial that P. and I saw in Brisbane. I also got notice of another manuscript coming for review and report. As well, I did a bit of administrative tidying up in readiness for the end of the month tomorrow. The warehouse at Landmark has been infinitely patient in holding on to my books for a long time, but has now called for stock reduction. This has meant contacting the authors to see whether they want copies. I hope to keep two of them which are selling a bit in print. Today, P., Frank and I were off to the Mall for shopping, thence to Smith Street and Caballero for an excellent brunch, which fulfilled P.'s request for a 'superior' brunch. The poached eggs on salmon on brioche with pancetta and cheese croquettes were a delight. Yesterday, I received a new first chapter and revised chapter outline for the Indigenous thriller. This morning I sent the author feedback and some more suggestions. The book is coming along very well and should be a corker. Then P. and I went into town to go to the National Gallery St Kilda Road. We didn't reckon on Swanston Street being closed to trams for some kind of Australia Day event (lots of patriotic giggle hats and youths draped in flags), so we had to walk all the way to the gallery. Once there, we went to the splendid Ron Mueck exhibition. I particularly liked the two sinister troll-like old ladies and the young man lifting his T-shirt to reveal a stab wound. The other pieces were good, though the large newborn girl with blood and umbilical cord was a bit disturbing. All of the pieces had a lot of emotional resonance. What more can you ask? We then lunched in the new gallery eatery upstairs. It is trying to be stylish, but our presence soon fixed that. I had a very nice mixed sandwich (P. described them as a homage to speed-bumps as they looked like little humps) and salmon with dill on pastry. P. had little roast beef rolls with mustard and an eclair filled with tiny strawberries. To keep up with the piss-elegance, he had Darjeeling tea. It was an excellent lunch. Afterwards, we took in a variety of photographs, drawings and a fine exhibition, Chinoiserie, which Ouyang Yu reliably informs me has no equivalent in Chinese, understandably. Home again to find that one of our neighbours was having a barbecue in the best Arfstrayia Day tradition. We've settled for roast chook with Frank which P. is preceding with bellinis. Strawberries and strawberry icecream to follow. Then Sally S. dropped in to return the new Anne Summers book which she enjoyed immensely, the only book in the world to contain both Winifred and Lucerne Crescents (Toorak and Alphington). 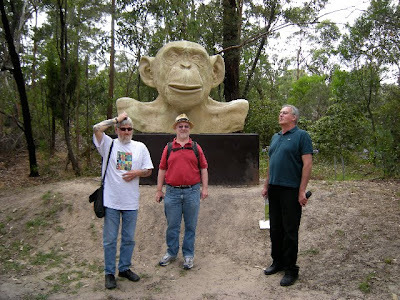 Bruce, Frank and Peter at McClelland Gallery outdoor park. Sculpture: Lisa Roet: White Ape, 2005 Pic: Lorraine E.
The Coen Bros A Serious Man did turn out to be rather bleak, a testament to the belief that if something can go wrong, it will. As one would expect, it is a beautifully made film with fine performances from a relatively unknown cast. We had a very adequate dinner at Trotter's after the evening screening. On Sunday, we went off on the big culture vulture tour to Mornington with Frank and Lorraine, starting with the always enjoyable McClelland Gallery, with a 'figure' exhibition from their collection and a Ric Amor series of maquettes, sculptures and drawings. After a quiet wander in the grounds, we went to the Mornington Regional Gallery for their landscapes of the peninsula, which were a splendid collection, including a few very good Amors and some likeable Tuckers, for a change. It covered a panorama of historical, well, panoramas and was definitely worth a visit. We then dropped into Julie and Roger W. for coffee and scones and a chat, followed by lunch by the sea at Mornington. Then off to Mulberry Hill, the old Lindsay place, but there was no one there for the 3pm tour. Perhaps we should have booked. Next time. The fishing manuscript has gone back to its author. I wish it well in the world, it deserves it. Now immersed in a large manuscript, quite innovative to say the least, for report to its author. It will take at least this week to read it around other things. Meanwhile, the memoir is creeping above 8,000 words. I need to decide whether to wrap it up, more or less as it is, or 'embellish' some more. Tonight, P. and I are off to see the Coen Bros A Serious Man, which Sally S. says is very dark. Went yesterday to Ear, Nose and Throat, and waited nearly two hours to be given a koala stamp and a brief examination. (Or the other way round). Next visit in three months. I also visited the cobbler/elves with a thankyou box of chocolates for all their good work and Christmas raspberries straight off the cane. Dinner with Rochelle went well. It was good to catch up at last with the energetic Rochelle, full of projects. Her new book is going well apparently. On Sunday, after the usual crossword, we went off to Bran Nue Dae, the film. My prejudice is to like Stephen Baamba Albert as Uncle Tadpole rather than Ernie Dingo, who wasn't bad. Baamba made a good fist of the role of the local priest, stealing every scene he was in. For the rest, it was very enjoyable, though with less Broome scenery than I expected. It was a bit like The Circuit with songs as most of the cast from that are in it, except Gary Sweet and Aaron Pedersen, and a very pleasant arvo in the cinema. On Friday, I met Alexis W. for brunch at the European cafe in Spring Street, Melbourne. I had a very tasty smoked trout and potato fritatta with an avocado accompaniment and we had a good catch-up. Today, it was time for a Brunswick shop again, so we went to Mediterranean Wholesalers to stock up on Grana Padana, anchovies, pasta etc. I also got a large leg of lamb for dinner tonight (Rochelle J. is coming). We then went to Fitzroy to Piedmonte's, which is always a delight. We finished off with brunch at the Green Grocer cafe in St George's Road, which purports to be an organic cafe, but is certainly delicious. P. had a Japanese pancake with smoked eel. A very exotic brunch; Frank had a poached egg on baked ricotta. My poached eggs with parmesan rosti and avocado were a much more conventional brunch. They also had very refreshing spritzig drinks: I had orange and elderberry, and P. had watermelon with ginger and mint. The lamb is sizzling in the oven, the vegies are on. Who says I'm obsessed with food. On Sunday, attempting to create a household network, I managed to get myself off the internet. All attempts at remedying this with my internet provider failed, and they suggested my modem might be kaput. Today, a Gizmo expert fixed the problem with: guess what, a new modem. Now we are (touch wood) fully operational again on both computers which is where we started on Sunday. Meanwhile, not a lot has happened. I checked my emails yesterday at the handy internet cafe in Smith Street and there was nothing desperate. I've finished reading the fishing manuscript, which is very good, and I'll now do a report on that. And mercifully, the cool change seems to have arrived. The slow-cooked lamb turned out very well, perhaps slightly overcooked at five hours, with spuds baked in their skins (another tactic to deal with uncertain arrival time). Dad arrived with P. from the airport, a little late, because of delays in baggage collection, and I served up nearly straight away. On Saturday, we did normal shopping with a very hot market morning at the farm, then the air-conned mall, then a very slow lunch at Madame Zou Zou's, which, when it finally came, was very tasty. In the evening, off to Movida Acqui for Lorraine's birthday. We had a series of smaller dishes which were all delicious, followed by splendid and appropriate desserts: a pineapple special and a trifle. The highlight for me was the pork belly with clams and beans, but the 'bomba', little potato balls with chorizo inside were pretty special too. To me, it was nearly a perfect dinner: just enough to eat, without stuffing you too full. It would be worth trying their lunchtime venue, Movida Terrazzo. Movida is becoming a real empire. It looked for a moment as though the sauce for last night's gnocchi would be 'too darn hot'. I dithered over two or three small chillies, and opted for three. However, when served, the addition of parmesan, lots of chopped chives and the peas kept the heat within bounds. Frank and I then settled in for a night of tellie, with a quite good Swedish movie, Deadline. The Swedes and Danes seem to punch well above their weight in crime/thriller flicks. I wonder why. Meanwhile, a new manuscript has turned up for report from a friend. It will be an interesting one, as it is outside my comfort zone. It is about fishing, an occupation at which in my few attempts I've been a dismal failure, as well as feeling it is a bit like watching paint dry or grass grow. I'll do my best. Stephanie's slow-roasted lamb will take a goodly part of the day. It's meant to cook for seven hours, but the piece of lamb I've got is about half size, so I'll reduced the cook to five hours and hope for the best. You seal the pot with a flour paste, so it's impossible to check on its progress, and the process is pure faith. Another problem is how long the roast vegies take on such a low heat. We'll see. It's been a very quiet week in Abbotsford. I had dinner at Frank's on Tuesday (a delicious spag. bol. followed by mango). I'm returning the compliment tonight with gnocchi and a tomato and pea sauce. Meanwhile, I sent off the 'final' version of the Penguin paper which elicited some very very helpful comments from Louise Poland, so there is now a revised and corrected version. I am getting close to finishing the memoir which requires a bit of polishing and maybe some additions before I send it around for comment. It has been an intriguing process deciding what to put in a publishing memoir, without breaching confidences or making it too personal, i.e. getting into areas which are properly private. Writing blog entries is good training for being public and private at the same time. I will need to circulate both the paper and the memoir to people I have mentioned in them, partly as a courtesy and to correct any errors. Peter returns from Brisbane tomorrow and Father is coming for dinner. I think I'll make Stephanie's slow roasted lamb. The apartments in West End in Brisbane were right opposite the address used as a title for David Malouf's book. Unfortunately, his old house has been replaced by the goods yard for Otis Elevators. There isn't even a plaque. Photo to follow. The apartments were quite serviceable and very well located close to many eateries which we tried (two Vietnamese, Greek, seafood). I had a good meeting with my thriller author, and was pleased to meet the author of the Palm Island history for a coffee. As well as visiting P.'s mum in Morningside, we spent a deal of time at the Asia-Pacific Triennial at the art galleries (it is in both galleries). It is huge and even after two visits, there were still things I'd missed. There was a great variety but most outstanding were the social realist works from North Korea, and a Chinese video which would definitely not have been approved by Tourism China (or equivalent). Neither would the Taiwanese video have been lauded by their authorities. The only blot on the week was arriving at the airport to find that my Virgin flight had been cancelled, and I had the dubious pleasure of extra time at the very barren Brisbane airport at which edible food is not to be had. I was very grateful for being picked up by my father to hasten my arrival home a little, but still didn't arrive home until after 11pm. Thanks, Virgin. It seems that there is NO airline on which one can rely for simple, basic, reliable service.